Melanie Suzanne Wilson's personal blog shares opinions and discoveries from life. Customs House is one of those awesome locations in the city that may get unfairly overlooked. There is so much to do here, it's perfect for a 'tourist' day or a working lunch hour. Just get to Circular Quay Station & it's a block before the water. There are plenty of reasons to check this place out. The floor on the ground level is anything but ordinary. 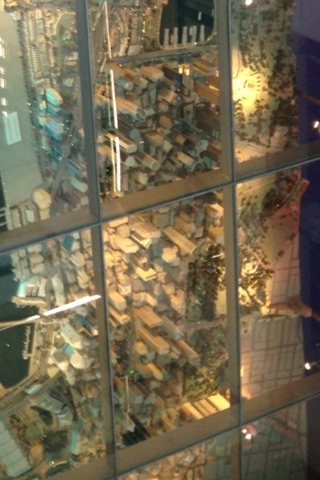 A miniature model of the Sydney city gives visitors a bird's eye view of all our beautiful landmarks. If you're a new tourist in town, this model will help clearly navigate and give the big picture of this sprawling city. Or if you're a local, see if you can spot your local hangouts in ant-sized form. What a perfect decoration to walk on every day! Of course there are other goodies here, but the other 2 are my faves. The place has a function room, restaurant, & informative displays about Aussie industries. But nothing beats a tiny library in Customs House, that gets more quiet than the State Library. Bravo Sydney! You are very welcome to post any friendly comments after blog posts. Both sides of all discussions are welcome. Keep it nice and constructive and join the conversation. The Seekers are celebrating a very special time in their lives, and including their fans in the festivities. Dudith Durham, Bruce Woodley, Keith Potger, and Athol Guy have been a band for 50 years. That's right, a Golden Jubilee means 50 years in show biz. Before we have a look at the latest media attention, here's a quick background into the world of Seekers tours. Judith Durham said on 60 minutes that they really had an easy career. Judith now realises she took for granted the instant TV coverage they received just a day after they arrived in England. Success welcomed the group whenever they wanted it. Judith then chose time off from the group for independence and to find her own identity. But the memory of The Seekers stayed with the public. And hence the later tours. The Sydney Morning Herald has implemented a monthly charge for users to access articles on their web site. Only the first 30 articles are free. Under the current system, readers would pay up to $300 a year. This dollar value assumes such a news source is not substitutable. Or is it? There was talk of this being planned for quite a while. But it is still a massive shock to the loyal readers. The good old SMH has kept a flow of revenue from advertisements for some time. That should be enough. Sometimes a pop up would grab our attention before being closed. A banner in the footer of the home page (that is an attempt at descriptive techie lingo) is all about American Express. Links on the right hand side promoted anything and everything. That should have been enough. Our favourite brands would have paid big bucks for exposure on a very popular online site. On the seriously popular app Pinterest, we can all be an artist. Or a cook. Pinterest allows egalitarian sharing of crafty creations and web sites with absolutely anyone. This how-to-DIY-guide of the social networking world is changing creative expressions of thousands of people. Pinterest is a potential shopping mall of the future. Amazingly unique and exotic gifts can be found on the site and ordered by price. Why wander around the shopping mall in search of something different when we can buy it at the click of a button? When we don't want to wait around for an auction on Ebay, there's always this collection of references to bargain sites. This R2D2 bin was sold on Etsy (& so was its image above) after some free advertisement on Pinterest. The DIY world is another reason to join the crowd at Pinterest. I took a bit of getting used to the technology (I'm getting old fashioned), but you just click on the picture and the referenced web page will appear. Let's do the Time Warp on Thursday! Why use a facial scrub? What does Gangnam Style mean?